This week’s number in the real world is numbers that are amounts. The technical term for this is intervals. Okay, that’s not that technical; but every now and then I have to throw out a mathematical term. Why? Why not! The following picture shows amounts for money, showers, and fuel. 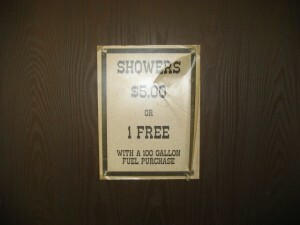 This is the kind of truck stop restroom I like to see – one that allows you to take one free shower if you fuel up with at least 100 gallons of fuel, or if your vehicle doesn’t hold 100 gallons (and let’s face it, not many vehicles do but I guess we’re at a truck stop so there are some vehicles in the parking lot that would), pay a reasonable fee of $5.00 for a shower. 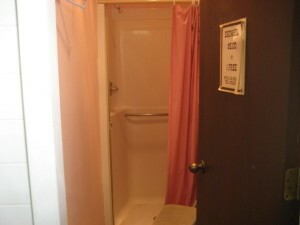 Often when I’m on a long road trip, I think, “Gee it would be nice to pull over at a truck stop and take a shower.” Not! 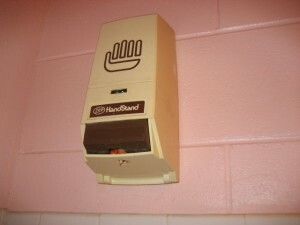 This sign is in the ladies restroom at the I-25 Pit Stop in Wheatland, Wyoming. Should you ever be in the neighborhood, pull over, fuel up, and lather up! The soap is on the house! After seeing the shower and the soap, you may be less inclined to spend the $5, but at least you know you have that option. And options, like money, showers, and fuel are good things to have. And as always, make this week count!